My name is Luis Gonzalez, and I am a Certified Public Accountant working for a group of 14 radio stations in "The Shining Star of the Caribbean," Puerto Rico. 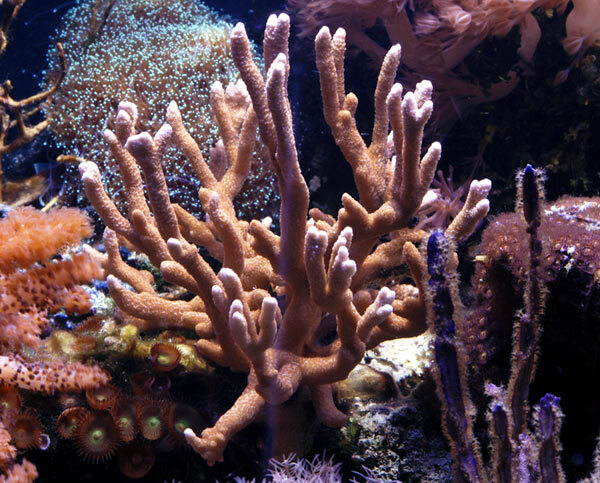 For me, it is more than an honor that my reef aquarium was selected to be "Tank of the Month" in the best and most informative forum on the Internet. I would like to thank all the members of Reef Central and some other people that I have never known personally but inspired me in this hobby. Books by Albert Thiel, Martin Moe, Julian Sprung, Charles Delbeek, Svein Fossa and Alf Jacob Nilsen among others were my reference for many years. Most importantly, I have to thank my wife for letting me have so many aquariums in our home. 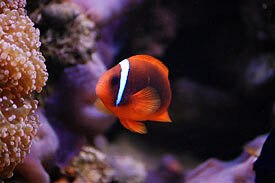 After 18 years of keeping saltwater aquariums, I have to say that it has not been easy. During those first years there was no internet and information was available from a limited number of books and magazines, and bio-balls were 'in'! Things have really changed a lot. 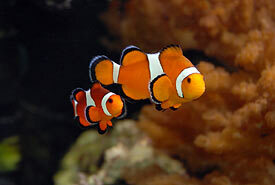 I started with saltwater aquariums during 1990 with a 55 gallon tank that used an under gravel filter. Three aquariums surrounded my desk. 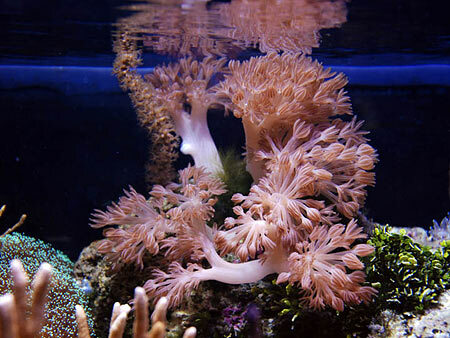 On December of that year I purchased a 100-gallon tank and started to build a "Caribbean" reef. I live in Puerto Rico, and I can actually say that I have a reef in my backyard. 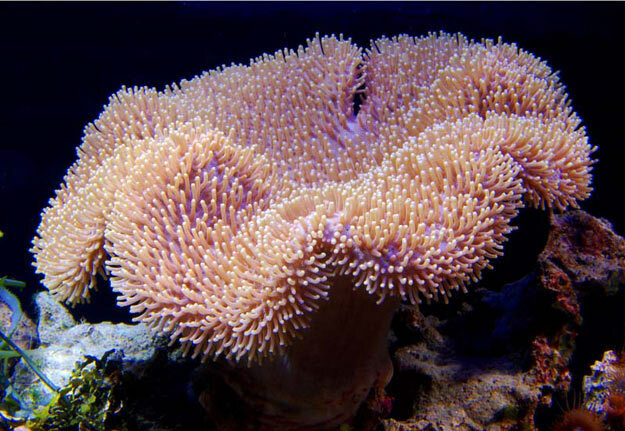 Since I was a child I loved to snorkel and I always wanted to have a reef at home. 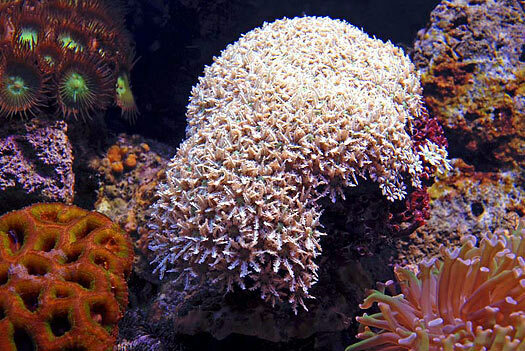 I visited MACNA in 1992 and from there my addiction for reef keeping exploded. 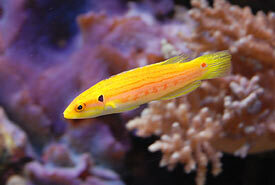 A leak in 1994 killed almost all my corals and fish in my 100-gallon tank but I never quit. Even after two hurricanes that resulted in weeks without electric power, I was still addicted. 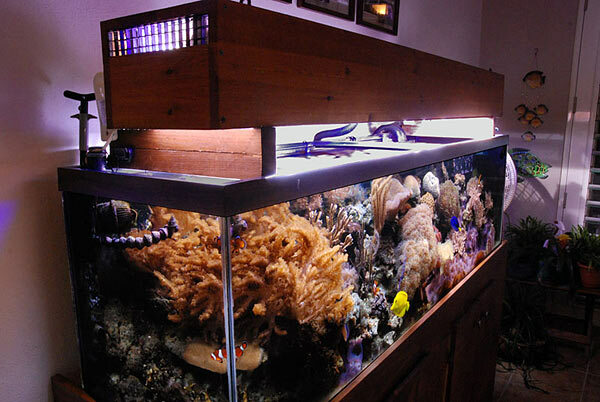 In 1999, I added a 125-gallon to my list of aquariums and transferred all my rocks, corals and fish from the 100-gallon tank. 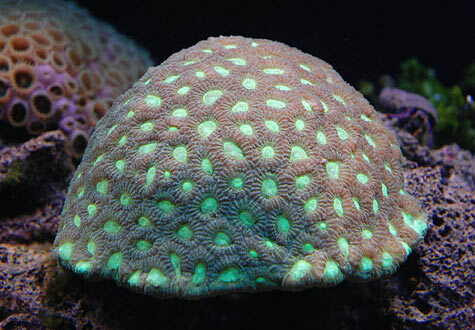 During those years I used several different approaches in my reef for lighting and filtration; from a lot of gadgets including ozone filtration, to just a hang on skimmer. All of them worked to some degree depending on the livestock. As part of a construction project at home in 2005, I decided to move my tank from the garage to my new terrace, which is more open, and now I can see the tank from inside the house. The garage was nice because there was no problem with water messes but now I enjoy more of the tank. My current tank has been set up for three years in the new location but all of my live rock is 18 years old! 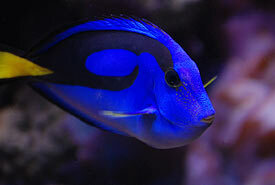 When I look at other Tanks Of The Month in Reefkeeping Magazine, I see very sophisticated and expensive equipment. Some have filtration rooms with hundreds of gallons of water. 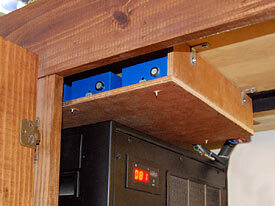 I can say that my tank is simple with a compact filtration system located inside the cabinet, under the tank. My reef was built on a limited budget. My sump, lights and cabinet were DIY projects. 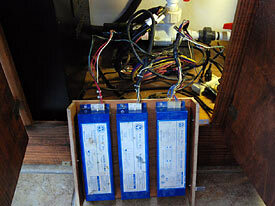 Even some of the other items like light ballasts, skimmer and some pumps were purchased used on ebay. 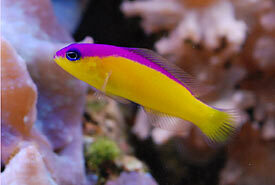 A large part of my tank’s budget is for electricity, which costs 31¢ per kilowatt here! There is no doubt that simple setups can also work. 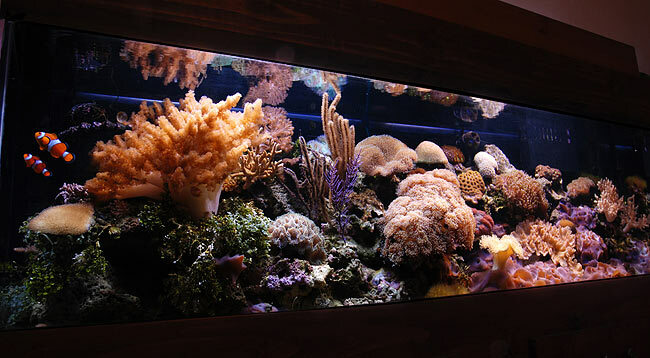 My tank is a 125-gallon, All Glass aquarium, which measures 72" x 18" x 22". Originally the stand was a steel frame but when the tank was moved, I constructed a wood cabinet with doors built around the metal frame. I am not a carpenter, but I like the stand and with some care anyone can build a stand and canopy. 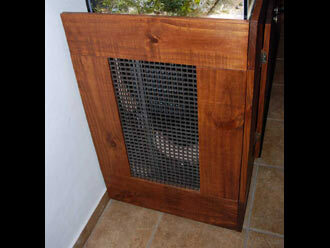 The wood canopy is mounted over two 2" x 4" pieces, so it can be moved to the back for easy access to the tank. 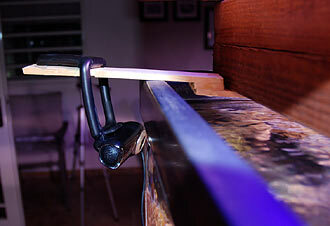 A piece of wood is placed to cover the open space between the tank and the canopy. I keep it open most of the time to dissipate heat. 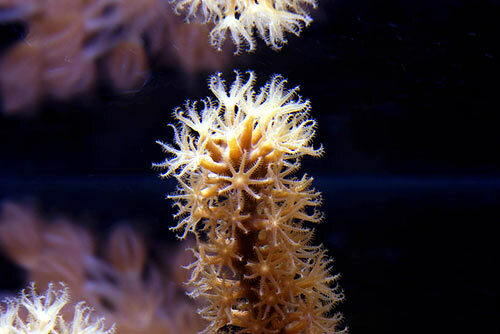 My reef is mainly a mix of LPS and soft corals and space is starting to be a problem because of coral growth, but that may be a nice problem to have. 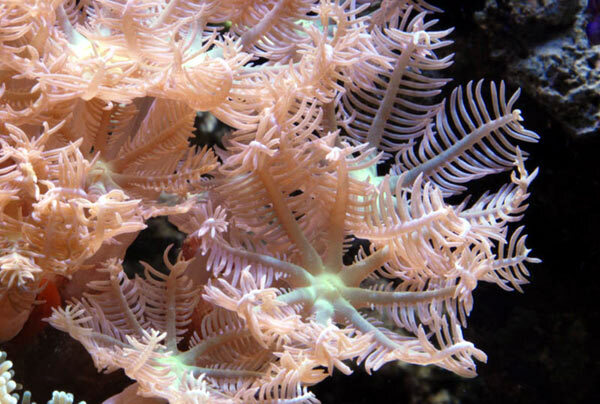 I understand the challenges of keeping SPS corals and appreciate their beauty, but for me LPS and soft corals are just as beautiful as SPS. 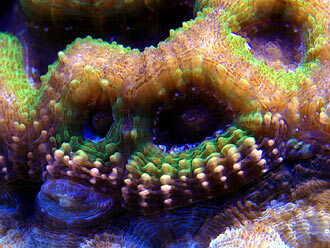 With simple equipment like mine I feel more comfortable with the corals I am keeping. 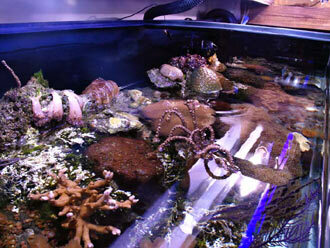 My previous tanks utilized sand beds of different depths resulting in algae problems in the long-term. Now my tank has a bare-bottom with lots of live rock; the "Berlin System." Return Pumps: Little Giant 4MDQ-SC 810 GPH and a Mag 5. 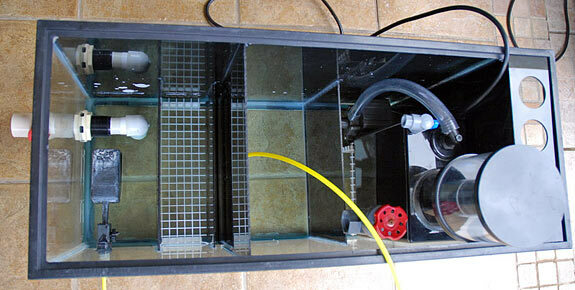 Water Movement: Two Koralia 2 powerheads, two Hagen Aquaclear powerheads behind the rock, two pumps in the sump returning water to the aquarium. 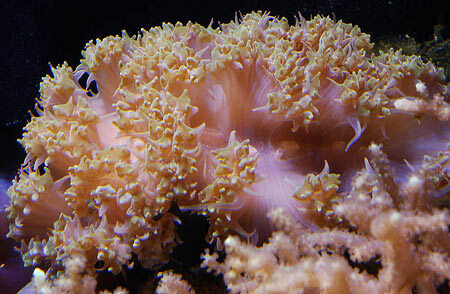 Lighting (display): Two 175-watt 10,000K Coralvue Reeflux metal halide, two 72" VHO, 1 SuperActinic and 1 ActinicWhite, both URI. All lights are lit by IceCap electronic ballasts. Calcium Reactor: Ecoplus calcium reactor, Milwaukee PH controller for CO2 dosing, with ARM media. Average temperature in Puerto Rico is 78° Fahrenheit with highs reaching 98° in the summer. 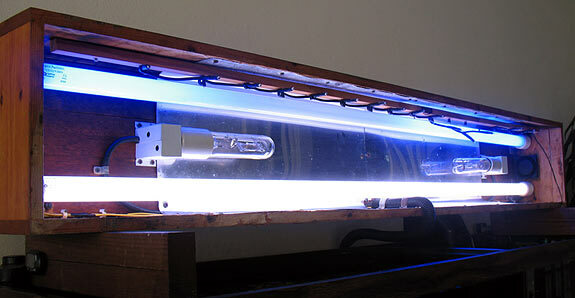 With metal halides and all the pumps, water can easily reach 100°. For this reason a chiller is a must with this set up. My ¼ hp chiller keeps temperature steady at 80°. To dissipate heat under the canopy I have two small fans which blow the hot air from under the metal halides. Also the tank is located in a ventilated area. 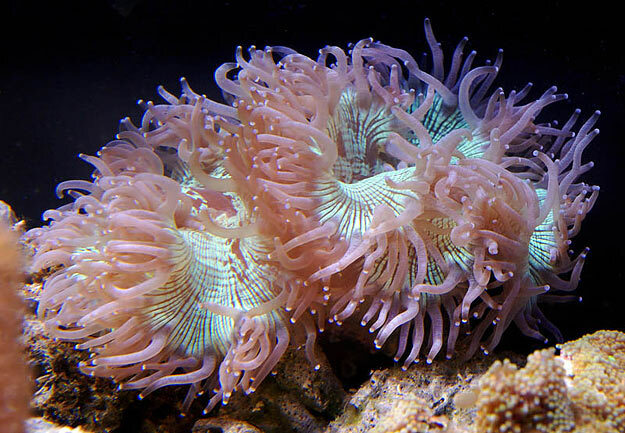 Now I have two Coralvue Reeflux 175 watts, 10,000K and two 72" VHO, 1 SuperActinic and one ActinicWhite URI bulbs, all ran with IceCap ballasts. The VHOs are on 9 hours a day from 4pm to 1am and the MH from 6pm to 12pm. I usually get home at 6:30pm and this is the time that I can enjoy my tank. All lights are on timers. My moonlights are on from 1:00am to 6:00am. I built my own lighting system. I have tried several metal halide bulbs, but in combination with my VHOs, the most pleasing color was achieved with the 10K halides. I also noted that growth was better with the 10K than with the bluer color. Because space is limited in the cabinet under my tank, I decided to build a compact sump for the skimmer and to have an algae filter with Chaetomorpha. 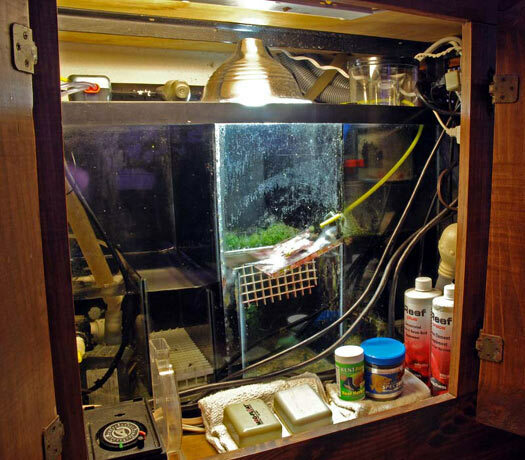 The sump is a 29 gallon aquarium with acrylic partitions. 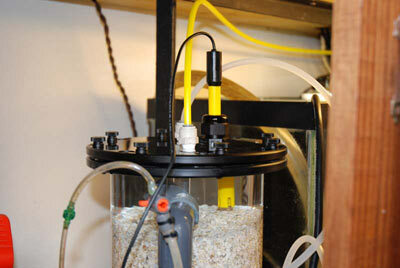 In the first area of the sump, I have an Aqua-C EV180 protein skimmer, which I find is compact and very efficient. 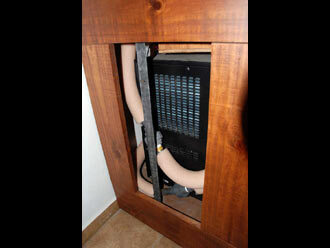 The Aqua-C is inside the sump in order to avoid flooding that I experienced with previous external skimmers. I upgraded the skimmer pump from the Mag 5 to a Mag 7. 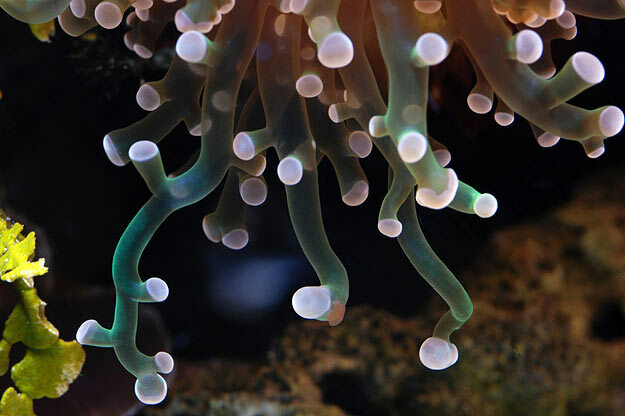 Following the skimmer is the Chaetomorpha macro algae with a spiral compact fluorescent 26 watt daylight bulb. 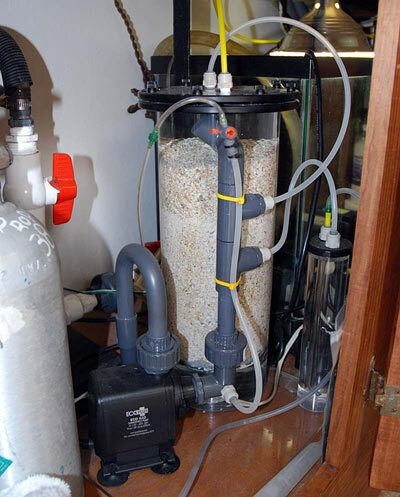 Effluent from the calcium reactor is mixed with the skimmer return to dissipate CO2. 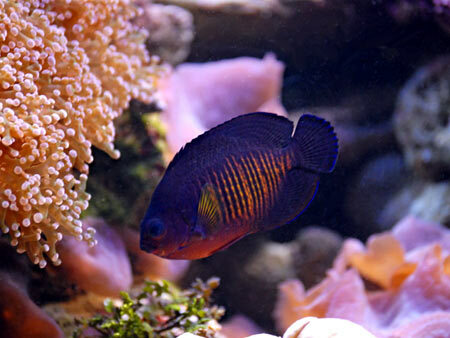 There is a section for mechanical filtration with no media, just in the event it is needed. Evaporation in my system is high due to the fans installed behind the light system. 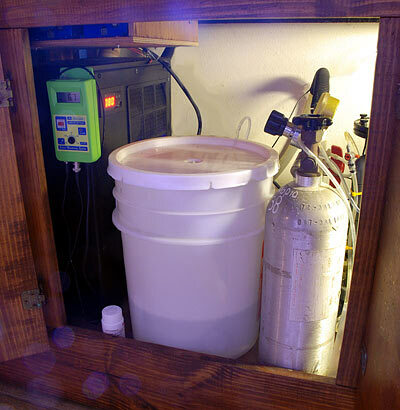 A five-gallon container filled with RO/DI water supplies top off water to the sump with a AquaLifter Pump connected to a Ultra-Life float switch located in the sump. From there, water is returned to the tank with two pumps; one is a Little Giant that passes through the chiller and the other is a Mag 5 that is also used for supplying water to the calcium reactor. 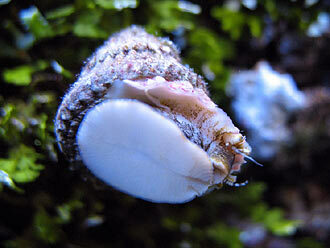 The only mechanical filtration in my system are two sponges in the overflow that are cleaned every two or three days. 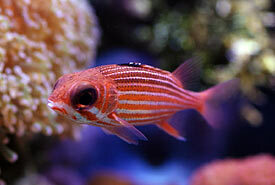 I currently don’t use any chemical filtration in my tank. My system is bare-bottom with no sand. 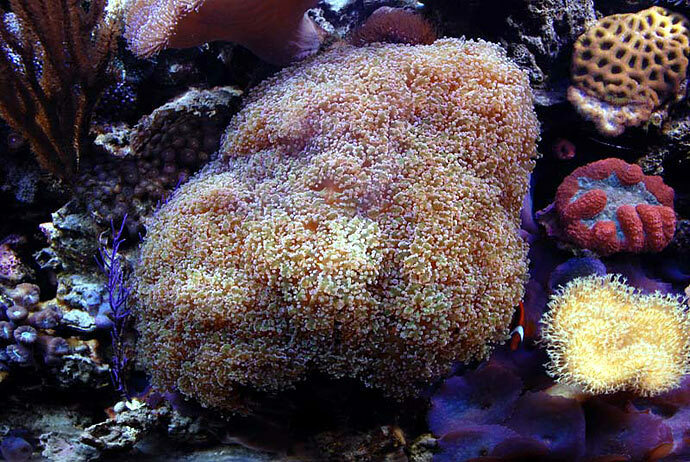 I decided many years back that I wanted a clean bottom and found that in the end you don’t see it because of rocks, mushrooms and coralline algae. 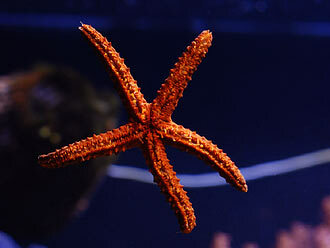 Live rock was placed over an egg crate rack, one inch high, which covers the tank from side to side. 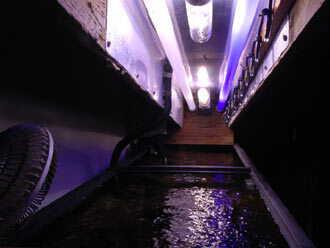 This provides circulation under the egg crate with two power heads located behind the rocks. Two Koralia-2 powerheads, one Mag 5 pump inside the sump and one external Little Giant pump that returns water from the sump to the display tank provides the needed circulation. 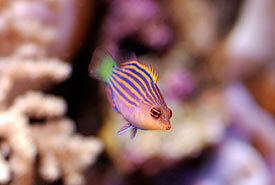 I try to keep my feeding of fish and corals to a minimum. 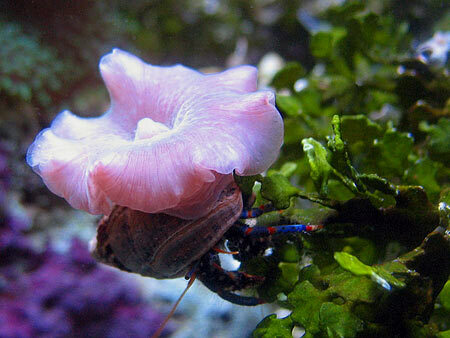 I have found that excess food is the main cause for algae to grow. 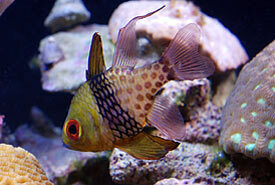 For fish, I feed once a day with small sinking pellets of different brands. I only feed what they can eat. Once a week I add some frozen mysis and brine shrimp. 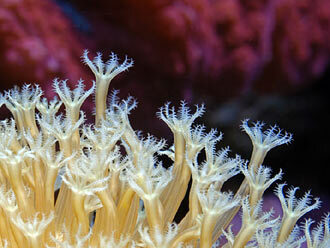 Corals are only fed once a month with a mix of frozen coral food, oyster eggs and cyclops. 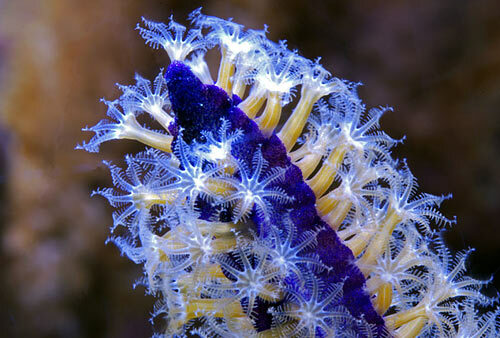 I feed directly over the coral with a dropper. 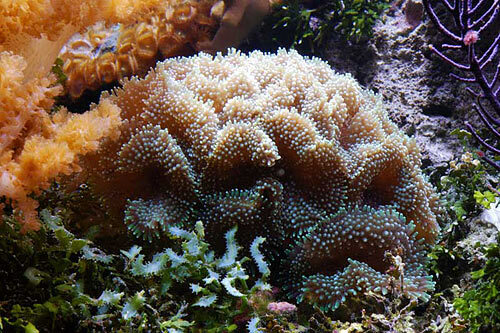 For some Large Polyped Stony (LPS) corals, I feed small pieces of shrimp for variety. A calcium reactor was installed in March 2008. Before the reactor, I was adding calcium chloride and buffer to maintain calcium and alkalinity levels. Now the reactor keeps up with the calcium demand of the system. 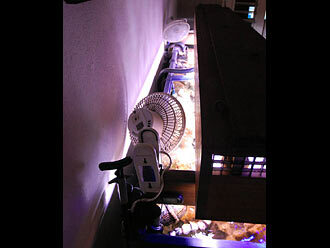 The Co2 system that I am using was previously used with my planted aquarium. The reactor was modified to install the pH probe inside the chamber for maintaining the pH. I keep the pH steady at 6.8 with a Milwaukee controller. The effluent from the reactor was adjusted to produce a steady stream of 120 ml per minute with 2 bubbles of CO2 per second. 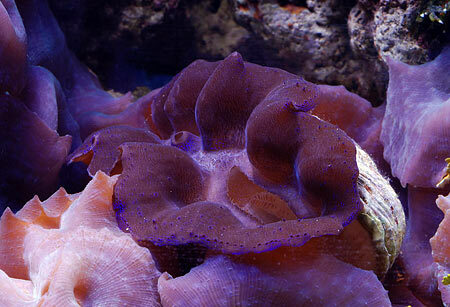 For additives, I am using two SeaChem products, Reef Trace and Reef Plus. They contain trace elements, vitamins and amino acids. One thing I like about my tank is that you can easily reach any point inside the tank because it is not too high. I have found that this way I can move things, clean the glass, etc. I keep a spread sheet in Windows Excel that outlines all events related to my tank, water changes, parameters, new inhabitants and any other observation for future reference. 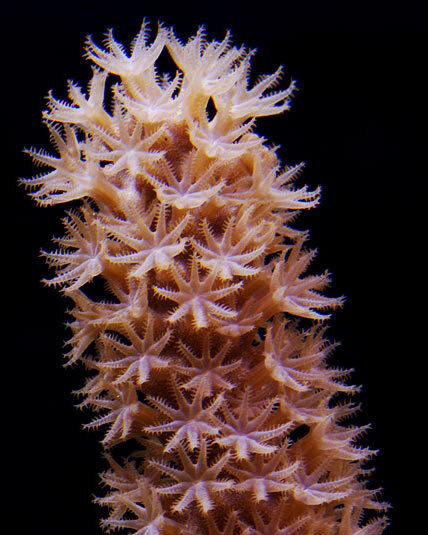 I take photos of my tank almost weekly to document coral growth and the impact feeding on my reef. 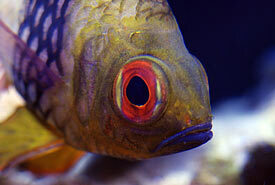 After measuring parameters for many years I decided to rely mainly on my eyes to determine water quality. The only things I measure are salinity maybe once a month with water changes, calcium and alkalinity monthly with Salifert kits just for curiosity because they are very predictable with the calcium reactor. I look daily at the temperature display in the chiller just to be sure that it is working properly. Thirty gallon water changes are performed monthly with reverse osmosis de-ionized (RO/DI) water using Coralife salt mix. 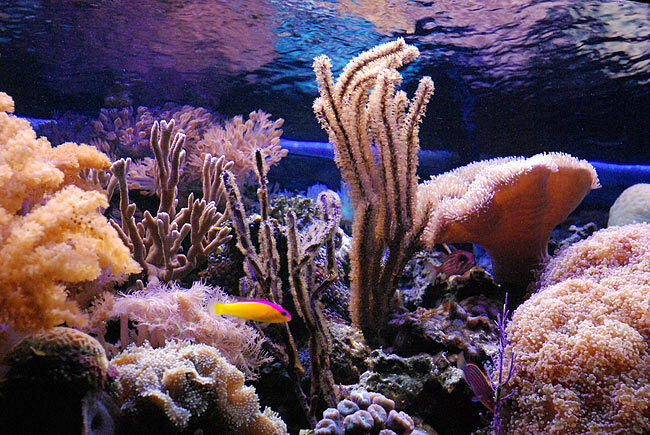 Temperature and salinity are adjusted to match tank parameters. 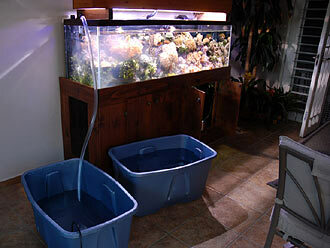 Water is mixed for 24 hours with a strong pump prior to the water change. 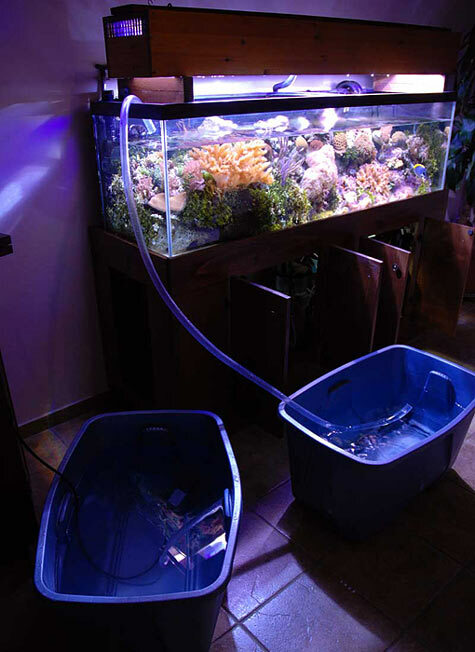 The tank bottom is siphoned during water changes and visible detritus is removed. The skimmer cup is emptied and cleaned once a week. 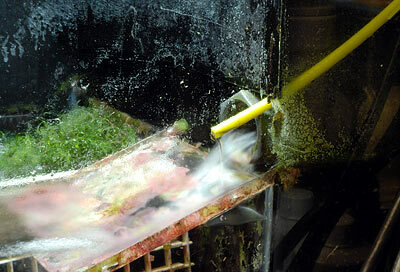 Overflow sponges are cleaned every three days and the front glass every three days. 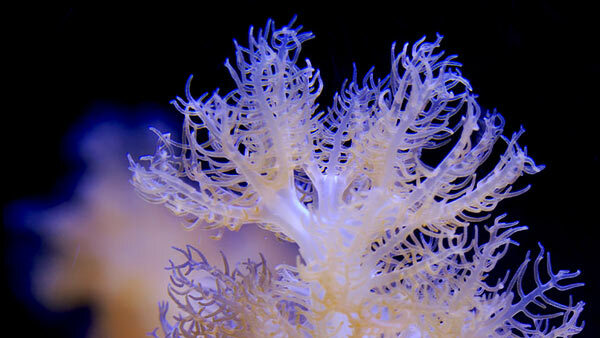 I look at and inspect all my corals and fish daily to make sure that they are doing ok and there are no negative signs that are visible. I also check water levels at the sump, the calcium reactor effluent and ensure that power heads and fans are working properly. 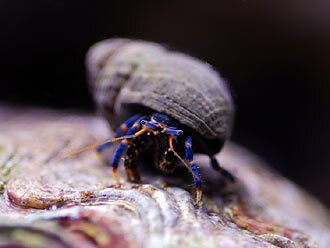 With my web cam I can check my tank two or three times during the day. 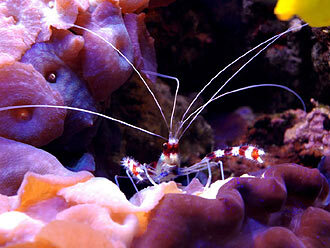 The Chaetomorpha algae inside the sump is pruned once a month. 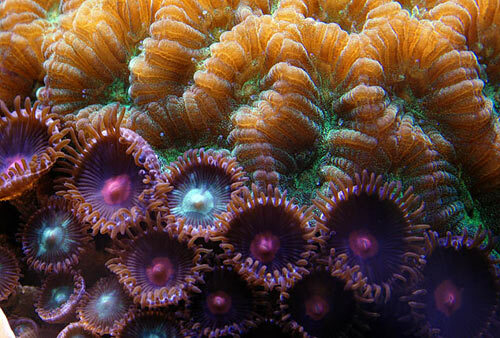 The key to success in this hobby is patience, perseverance and the ongoing research for information from other reef keepers to create the best aquarium possible with available resources. 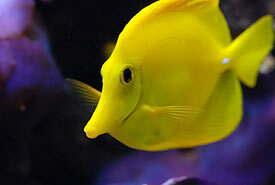 In closing, I would like to thank my fellow reefers at AMEPR.org, our local Puerto Rico forum, for sharing with me this excellent hobby.